A new iRecruit Data Manager is now available for Sage HRMS (Abra) version 9.2057. The Data Manager application supports the transfer of new hires from iRecruit into the Sage HRMS database. 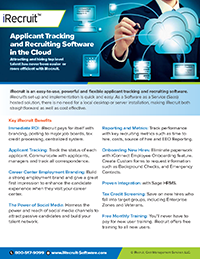 iRecruit typically populates 100+ fields from iRecruit into Sage HRMS, including customized data fields. If you have any questions about the update, or need support, please call us at 1-800-517-9099. This entry was posted in Blog, iRecruit Blog and tagged data manager, iRecruit, sage abra, sage hrms. Bookmark the permalink.